Ellison finds evidence that Sarah Connor may not be so insane after all; Cameron discovers ballet; John discovers a shocking truth about his mother. The title of this episode is derived from the Harlan Ellison short story "Demon With a Glass Hand", which some fans believe was one of several of James Cameron's inspirations for The Terminator from Ellison works. Cameron becomes interested in ballet dancing during her mission to track down the Turk in this episode. Actress Summer Glau was training as a ballet dancer until suffering a broken toe in 2002. 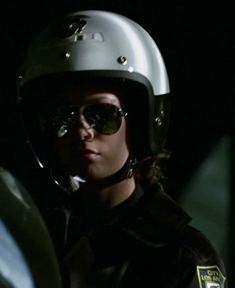 Summer Glau just looks too adorably cute as a motorcycle cop, don't you think? The costume is an homage to that worn by the T-1000 as a motorcycle cop in Judgment Day. A piece of electrical equipment from S&C Electric Company is seen at 1:25 on the Blu-ray. At 1:56 on the Blu-ray, Cameron shoves her hand into a rapidly rotating electrical turbine to stop it, but receives no damage to her glove or the skin on her hand! Cameron robs an evidence locker at the Central Los Angeles Police Department. This appears to be a fictitious branch of LAPD. In the mausoleum, Sarah passes crypts for Jim Dark and Paul Mason (and numerous others that can't be made out) on her way to the crypt of Andy Goode. As far as I can tell, there is no significance to these names other than Andy's. Andy's crypt reveals his middle name was David. When Sarah calls the FBI posing as Sgt. Johnson at the Property department of LAPD, inquiring about the missing "prosthetic" hand, she does it while sitting on a swing in the backyard of her house. Doesn't that introduce extraneous outdoor noises into the call that would tell the FBI man on the other end that the call was suspicious? It seems unlikely an LAPD property master would be calling from anywhere except their office. At 6:42 on the Blu-ray, we see that Agent Ellison has Sarah's FBI case file box on the Miles Dyson murder. Seconds later, we see the box also contains the case folder of her time at Pescadero State Hospital, where she spent time as a mental patient as seen in Judgment Day. At 6:56 on the Blu-ray, as Ellison watches the video of Sarah overturning her bed in her cell at Pescadero, notice that the sink toilet in her cell gets shoved around when her bed strikes it! Clearly, it is just a prop and not an actual sink/toilet mounted in the floor and wall. At 8:31 on the DVD, Ellison has a Stouffer's frozen dinner in his freezer. The episode states that Sarah spent three years of her life in Pescadero State Hospital. In Timeline JD-2, "Search Mode" states that Sarah spent two years under Dr. Silberman's care there before her escape, although in that case it's not clear if she may have spent a year there before that under the care of another doctor. Also in "Search Mode", Dr. Silberman becomes a patient at his own mental hospital, whereas here he is said to have retired to a mountain cabin in Arrowhead right after Sarah's escape. "Arrowhead" is likely a reference to the community of Lake Arrowhead, CA in the San Bernardino Mountains. At 11:38 on the Blu-Ray, the window of the ballet studio shows that it is called East Valley Ballet Studio. The music playing at the ballet studio is "Gnossienne No. 2" by Erik Satie (1893). Cameron asks the ballet instructor, Maria Shipkov, what dance another student is doing and is told it is the Pas de Chat, French for "step of the cat". Pas de Chat is an actual ballet move. Ironically, Maria tells Cameron that her movement is a little "mechanical". As John finds Derek loading guns with ammo in Sarah's bedroom, notice at 13:51 on the Blu-ray that a hair is stuck on the camera lens in the bottom-right quarter of the screen! The tea cups Dr. Silberman uses at his cabin are seen to be made by Charter Club at 20:34 on the Blu-ray. The quote Dr. Silberman reads from Matthew 7:15 about "Beware of false prophets" is the actual quote from the Bible. Sarah tells Derek that his brother, Kyle, is "in the grass" and that she can take him there someday if he wants. Presumably, the city or state would have buried his body after the events of The Terminator in 1984 and Sarah learned where the grave was. During his conversation with Agent Ellison, Dr. Silberman describes the events of Sarah's escape from Pescadero Hospital and the appearance of the T-800 and T-1000 Terminators in Judgment Day. He describes the T-800 reaching out to Sarah and saying, "'Come with me if you want to live.' like God reaching out to man. Like... like the Sistine Chapel." The Sistine Chapel is a Catholic chapel at the Vatican which features the famous painting The Creation of Adam by Michelangelo on its ceiling, with God reaching out a hand to Adam. John tells Derek about some foster parents he once stayed with when his mother was incarcerated, Todd and Janelle. Todd and Janelle Voight were the foster parents seen in Judgment Day. Notice that the scene of Cameron allowing the Shipkovs to die and the scene of Silberman setting fire to his cabin with Ellison trapped inside underscore how the former psychiatrist has become a terminator himself in his sociopathic breakdown. Sarah says the date on the video tape when she gave up custody of John, was June 8, 1997. But she should have said 1995 to be in continuity with Judgment Day. The music that plays as Cameron dances ballet at the end of the episode is Chopin's Nocturne in C-sharp minor (1830). This is the same music that was playing at the "torture house" in the future in "Dungeons & Dragons".